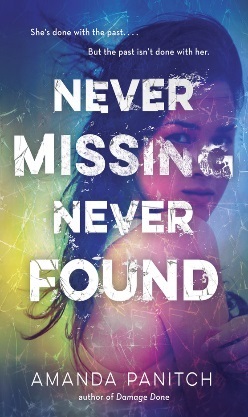 With a to-die-for twist, fans of Lauren Oliver’s Vanishing Girls, Laura Ruby’s Bone Gap, and Pretty Little Liars will enjoy the this deliciously disturbing, heart-in-your-throat thriller NEVER MISSING, NEVER FOUND. From the beginning, the premise of the book had me hooked. Much like those Lifetime movies (which are all too real sometimes), the drama and the twists and turns were infallible. Following Scarlett as she flashes back to what happened to her when she was kidnapped as a child kept the pace progressing fast enough. Now a teenager with her first job at an amusement park (reminded me a little of Adventureland, in a good way), Scarlett is trying to get her life back to normal, but like those Lifetime movies, things go south rather quickly as the girl who helped her with the job a few days ago is now missing. Now, Scarlett must face her past, and Panitch writes the flashback episodes with grace, as we gradually learn about Scarlett's kidnapping and what it was like for her and her fellow prisoner, Pixie. Not only is remembering Pixie difficult for Scarlett, there's a girl at the amusement park (Katharina) who reminds Scarlett of Pixie. And just when Scarlett is gaining a few friends and crushing on a fellow coworker, the rug is ripped out from under her, and she's not sure who she can trust--a feeling she's all too familiar with. That lack of trust, however, is a key element in the book, as Scarlett herself must be very careful with the reader, only letting him/her in a little at a time. How clever! I could definitely see this one flying off of my shelf in my classroom as the drama makes for a quick read. Teens will connect to Scarlett's hesitance to trust and her slow acceptance into being more social.